Kampala—On the 23rd of July, the Ugandan Judiciary announced that the pretrial hearing of the case Uganda v. Thomas Kwoyelo had been adjourned indefinitely, due to a shortage of funds needed to hold the hearing. The Pretrial Judge of the International Crimes Division (ICD) was expected to deliver a ruling that would determine the confirmation of charges against Kwoyelo and whether the case would proceed to trial. Kwoyelo is facing 93 charges of war crimes and crimes against humanity including willful killing, enslavement, torture taking hostages, sexual violence and extensive destruction of property in Gulu and Amuru. It has been almost a decade since Kwoyelo was captured and detained, but his trial is nowhere close to conclusion. While the Kwoyelo proceedings remain stuck at the pretrial hearing, the trial of Dominic Ongwen at the International Criminal Court (ICC) which began in 2016 – five years after Kwoyelo’s case had commenced –has by contrast advanced steadily, and is at a stage where the defence is expected to start presenting its evidence in September 2018. During a public dialogue to commemorate the 20th Anniversary of the Rome Statute in Gulu, victims expressed frustration with the continued delays in the proceedings against Kwoyelo at Uganda’s ICD, while vocalizing satisfaction with how the trial of Dominic Ongwen was progressing. Although it is important to acknowledge that the ICC has significantly more resources and technical capacity than the ICD, the Ugandan Judiciary could do more to mitigate the delays in the case against Kwoyelo. 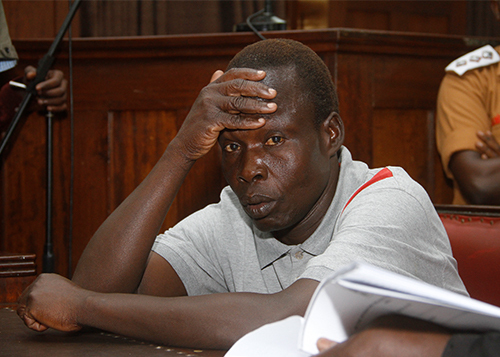 Efforts to prosecute Kwoyelo started in 2011, but the trial was stalled after the Constitutional Court ruled that the defendant was eligible for amnesty and ordered the ICD to stop his trial. Almost four years, later in April 2015, the Supreme Court overturned the decision of the constitutional court and reinstated Kwoyelo’s trial before the ICD. The Supreme Court premised its decision on the view that whereas the Amnesty Act granted no prosecution for treason to those combatants who renounced rebellion, it did not extend the same protection to the kinds of acts against a civilian population with which Kwoyelo was charged. Under Article 28(1) of the Constitution of Uganda, all persons have the fundamental right to a fair, speedy and public trial. This right requires that if a person is charged with a criminal offence, they should be afforded a trial within reasonable time. The slow pace of prosecution not only violates Kwoyelo’s fundamental right to fair and speedy trial, it amounts to a denial of justice for the victims, who can only access redress when the accused is accorded a speedy and fair trial. “The State has a statutory and constitutional obligation to provide the minimum resources needed to conduct trials at the ICD. Its failure to do so casts doubt on the level of genuine political commitment by the government to deliver justice to victims and address impunity for international crimes,” said Fernando Travesí, Executive Director of the ICTJ. Following the Supreme Court decision, Kwoyelo’s trial was set to resume in February 2016, however it was adjourned, because the ICD was in the process of developing its Rules of Procedure, which incorporate international standards and good practices from other jurisdictions. In June 2016, after the coming into force of the ICD Rules of Procedure, Kwoyelo’s pretrial hearing was scheduled. Two years later, there has been limited progress. The shortage of technical and financial resources to hold hearings, facilitate legal representation of victims, provide protection measures for vulnerable victims and witnesses, and conduct outreach in affected communities have contributed to the slow progress of the proceedings. The delays have also been occasioned by the absence of Kwoyelo’s lawyers during the hearings. At a recent event hosted by the African Legal Aid, the Attorney General of Uganda proudly noted that Uganda is one of the first countries to give effect to the principle of complementarity, following the establishment the ICD, which is tasked with adjudicating Rome Statute crimes. While it is important to apply international standards and best practices gleaned from other jurisdictions, this should not be done at the expense of an accused person’s right to an expeditious trial and victims right to a timely remedy. The judiciary should take all necessary measures to prevent any further delays in the criminal proceedings against Kwoyelo. Failure to do so will defeat the ends of justice.